Findings from research, to be launched in Christchurch on 9 July, demonstrate the “profound” impact of Ōtautahi Creative Spaces’ programmes on artists’ mental health and wellbeing. Analysis of the innovative arts programme by Ihi Research and Development has revealed how it has helped those involved to become more connected and resilient with improved social skills. Ihi Research and Development Director Dr Catherine Savage says the research reveals there are many therapeutic and positive impacts associated with being an artist in a highly creative, resourced and safe community of practice. 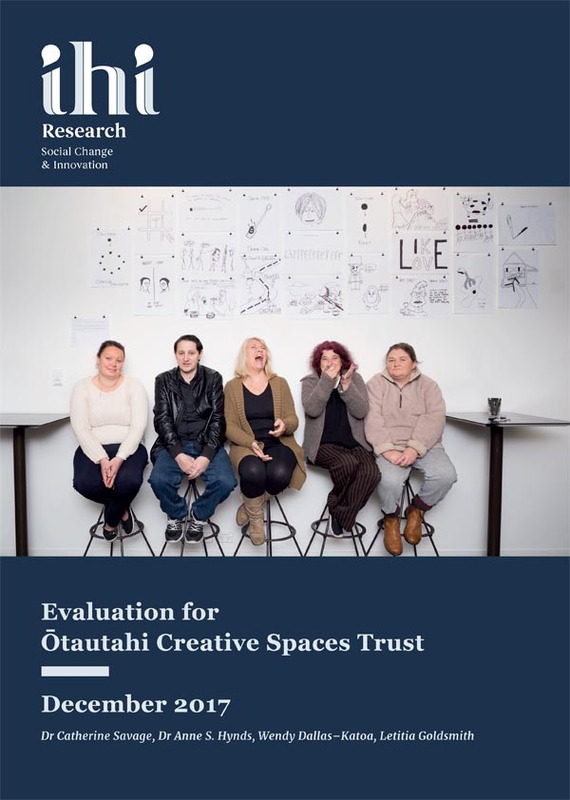 You can download the report, Evaluation for Ōtautahi Creative Spaces Trust. Ōtautahi Creative Spaces was set up in Christchurch in 2015 with a goal of boosting wellbeing, social connection and resilience through creativity. Its purpose was to respond to the high levels of mental illness, distress and trauma following the earthquakes by using a creative practice aimed at supporting vulnerable people to live full, aspirational and creative lives. The findings come as no surprise to Ōtautahi Creative Spaces director Kim Morton. “The research backs up what we’ve always known: that providing a creative outlet for people with poor mental health helps to grow self-worth and self-esteem, and leads to new connections and friendships. “I’ve witnessed the extraordinary changes that artists have made in their lives, with renewed purpose and energy, a strong connection to other studio artists, and development of their creative practice. The artists inspire and encourage each other. It’s all about belonging and feeling valued. She believes organisations like Ōtautahi Creative Spaces have the potential to do even more to support people with compromised mental health, and is calling on the Government’s Mental Health and Addiction Inquiry to address the current inequities in funding. “Despite evidence showing the impact of creativity on health and wellbeing, there’s a real lack of funding consistency across the country. “Some district health boards provide substantial funding for arts and health programmes while in areas like Canterbury there is no health funding invested in arts and health. The research is based on interviews with 20 participants, and qualitative analysis of the programme was conducted by Christchurch’s Ihi Research and Development. Funding for the research was provided by Red Cross. The programme provides participants with a distraction from their mental health condition and an opportunity to concentrate on something positive. Ōtautahi Creative Spaces enables participants todevelop new mindsets, learn new skills, and have pride in accomplishing something different and challenging. As a result, new artists feel more connected to their family, friends and communities. Participating artists explain how the process of learning new art-making skills has impacted on other aspects of their lives, such as reducing smoking and getting fitter. Participants says they feel more resilient as they take risks and learn new creative techniques and improved social skills, both within the creative programme and also in the wider community. You can download the report, Evaluation for Ōtautahi Creative Spaces Trust or email Kim Morton for a copy.